My husband and I have been enjoying the warmth of the Hawaiian tropics for the last few days. It’s certainly been a welcome escape from all the rain we left at home. This is the second Christmas we’ve spent outside of California–one can hardly complain about being in paradise–but it does feel different to be spending the holidays drinking mai tais (okay, I actually prefer wine) and lounging on the beach. I’m more accustomed to skiing this time of year but again, I can’t complain. The older my husband and I get the more we seem to crave warm weather. We’ve been eating resort food the last few days–Island-style salads and grilled fish–and while it’s mostly been good, I’m starting to crave a taste of some home cooking. One dish that comes to mind is one I prepared before we left for our trip. As an answer to my husband’s request to prepare the polenta “fries” I served a few weeks ago, I made these crisp polenta rounds instead. I used the same recipe but I had in mind to dress them up to make them fit for a party. This is my version of shrimp and grits. 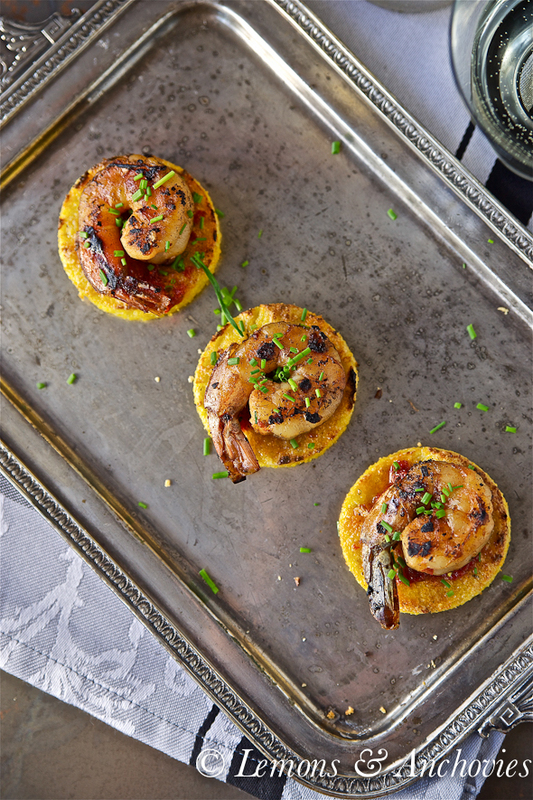 I used a simple sun-dried tomato dipping sauce to bring the polenta and the prawns together for a finished product that has a nice balance of flavors and textures. I cut 2 1/2-inch rounds for my large prawns but these could easily be made smaller and with shrimp. These are very easy to prepare–make the polenta and the dipping sauce ahead of time so all you have to cook are the prawns before you plan to serve them. I can’t think of better eats to ring in the new year with than these polenta rounds (and a glass of bubbly, of course!). To prepare the polenta: Place a piece of parchment paper on a 9x13-inch baking pan and brush with olive oil including the sides. Combine the polenta, stock, water, sage and herbs in a medium saucepan and bring to a boil over medium heat. Once it boils, reduce the heat to medium-low and cook, stirring constantly with a wooden spoon, until the polenta starts to separate from the sides of the pan, about 10-15 minutes. Stir in the butter and cheese and cook for another minute until the butter and cheese have melted and been incorporated into the polenta. Transfer the cooked polenta to the prepared baking pan; flatten and smooth the top with a rubber spatula. Allow to cool and set; this will take about 30 minutes. 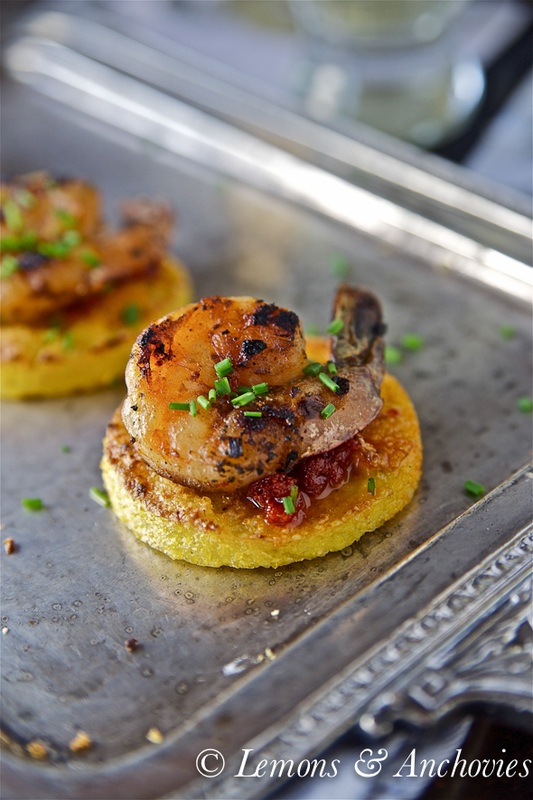 To crisp up the polenta, cut into rounds using a cookie cutter, brush the tops with olive oil and broil using a baking sheet for 2-3 minutes or until brown on the edges. 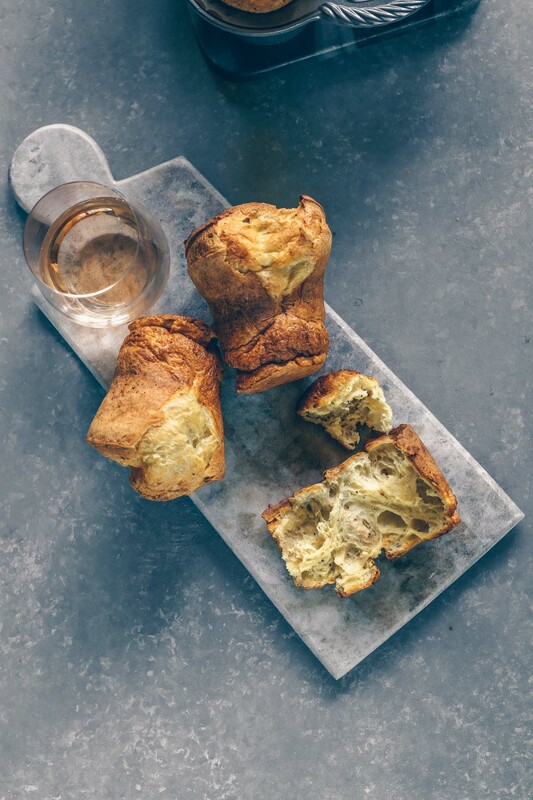 To prepare the dipping sauce, process the sun-dried tomatoes, garlic and anchovy fillet in a food processor until smooth. Add a drizzle or two of olive oil to reach a consistency you like. To prepare the prawns, cook in olive oil over medium-high heat for 2-3 minutes on each side or until just pink. Marinate in lemon juice and salt beforehand if you prefer. Assembly: Spread a little of the dipping sauce on top of the polenta rounds then top with one prawn. Serve warm. Love your fabulous, healthier version of shrimp & grits! Wish I were in Hawaii languishing on the beach 🙂 Enjoy and Happy New Year, Jean! Just beautiful. I also love using polenta rounds as a base for a myriad of different toppings but I think yours could be a winner. I have been cooking up a polenta storm at home too! It never disappoints. Have a wonderful time being enveloped with the warmth of Hawaii! Have a Prosperous and Happy new Year Jean! Cheers! Sooo envious of the fact you are in Hawaii… It’s been so cold in Kansas… Love this dish! So gorgeous and fancy! Love this appetizer, Jean! 3 of my favorite things in one bite :). Beautiful dish! I think I could eat prawns morning, noon and night. A great idea and recipe! Such perfectly sized little bites for a cocktail party! these look so simple and so amazing! I am book marking this recipe to make in the near future! I would love to be in Hawaii right now 🙂 This is such a lovely appetizer and so much more elegant than traditional shrimp and grits! These sound divine! 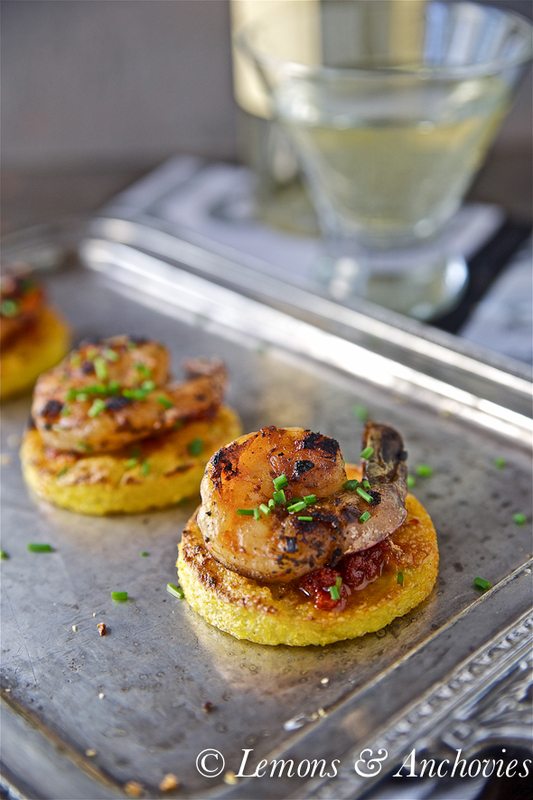 I love the crispy polenta and the shrimp together. 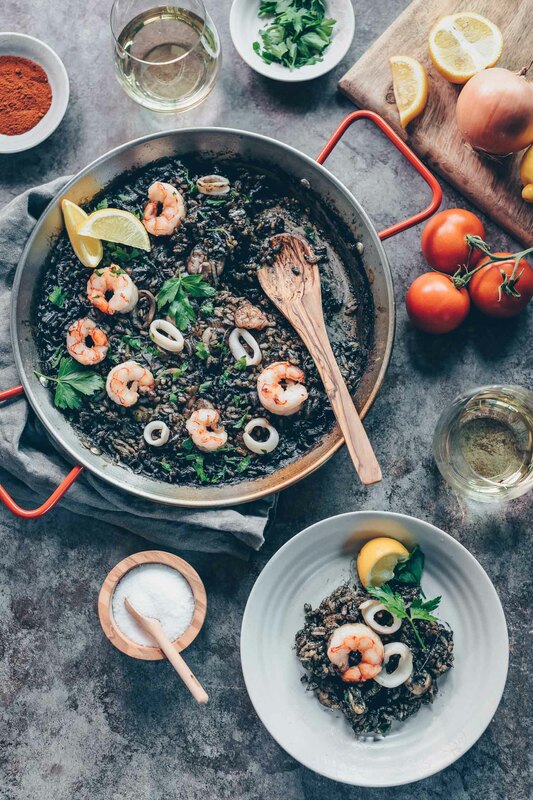 Perfect for a party, or just a light dinner at home! OMG – so loving these little delights! 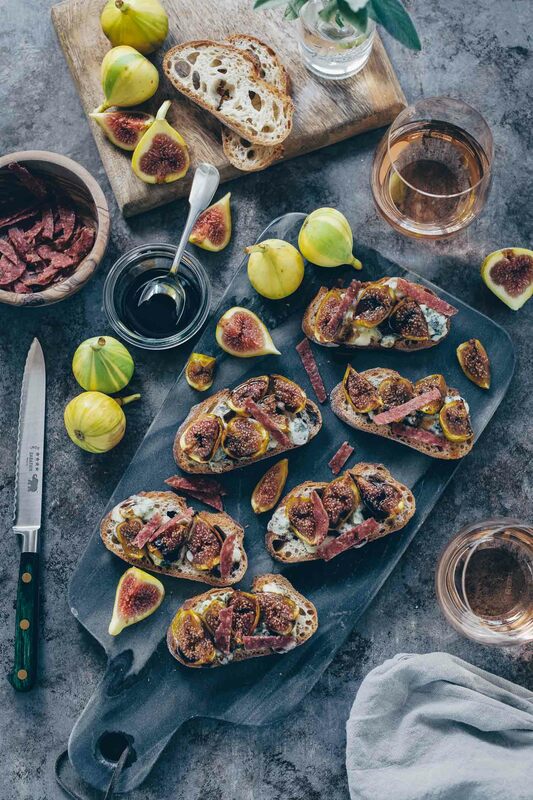 Can only imagine with a chilled dry white wine and a roaring fire in the background, while enjoying these! TASTY!! !